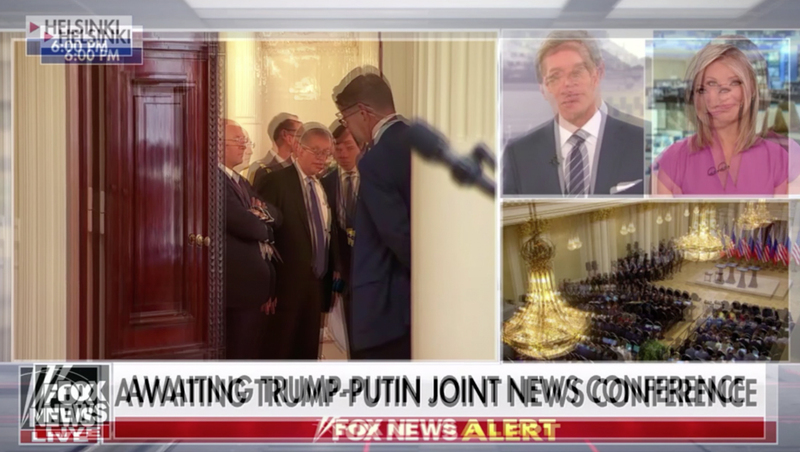 The Fox network’s simulcast of Fox News‘ coverage of the Trump Putin Summit in Helsinki, Finland, experienced an odd audio glitch in at least one part the country. The issue, which made all of the Fox hosts and commentators sound like like their voices were echoing, lasted until about eight minutes past 10 a.m. central time for Chicago area Xfinity subscribers. It’s not clear how widespread the issue was, if at all, outside of the Chicago market. The issue was fixed a few minutes before the joint press conference started — which was probably a good thing since Putin, speaking in Russian, had a translator’s voice overlaid on top of his, so the echo effect would probably have been even more confusing. The glitch is notable given that Fox News is referred to by some as an “echo chamber” of Donald Trump and the White House. However, this time around, many Fox News hosts and analysts, however, expressed disapproval of Trump’s actions and statements at the Helsinki press conference.